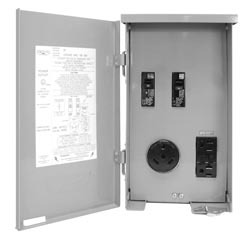 Provides electrical receptacles in a single enclosure for RVs. Rainproof enclosure features unique cover design which allows cord to be used when door is closed. Safe and easy to install. 30A, 120/240V, TT-30R and 5-20R2 GR NEMA receptacle. 20A-1 pole and 30A-1 pole circuit protection. 12-3/8"H x 7-1/8"W x 4-3/4"D.